Wash your hands thoroughly to avoid contamination. Grab a sterilized bottle and place it over a clean area for preparation. Measure the powdered formula carefully with the scoop that comes in the package. Fill each scoop to the top, leveling with a knife so you don’t have surplus or lacking amount. If you are using concentrated formula, measure the adequate amount inside your baby’s bottle, not forgetting to check at eye level. Continue adding an equivalent amount of sterilized water to the concentrate. Shake thoroughly to make sure the formula is well incorporated with the water. If you didn’t use all the concentrated formula, cover the container thoroughly and store it in your refrigerator; use it within 48 hours. Likewise, carefully cover your formula container and store in a dry place. Once the bottle is prepared, you can feed your baby! There is no need to warm or cool the formula, just make sure to prepare it with room temperature water. Remember to feed your baby within the hour. If you stored the formula at room temperature, the hour has passed or your little one did not finish his portion, throw it away. 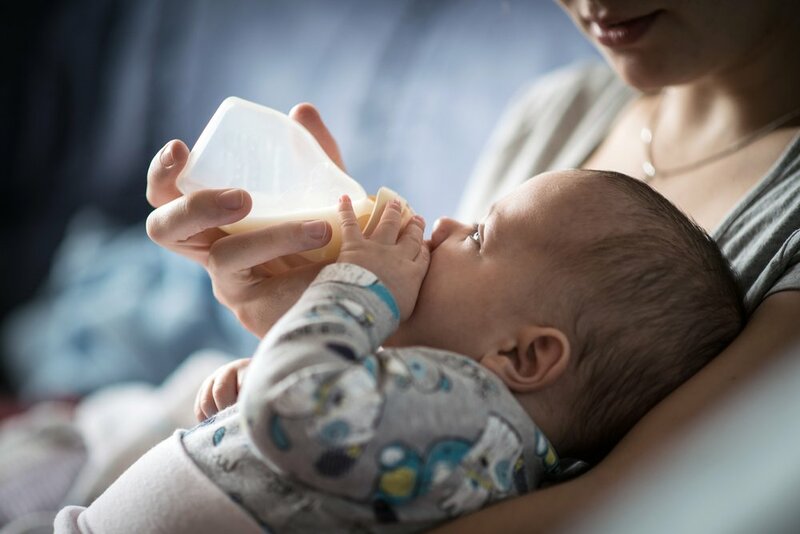 If you know your baby will not drink his bottle within the hour of preparation you can safely store it in the refrigerator and use it within the next 24 hours.